All control instruments used in Advantage liquid and water chillers, temperature control units and water systems are covered by the machine’s warranty. Proprietary “tailor made” instrument are manufactured specifically for Advantage by our affiliated company Advantage Electronics. 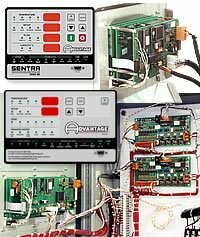 If you experience problems with your Advantage control instrument, it’s as easy as 1-2-3 to execute our repair or replacement system in order to get your Advantage equipment running. Call Advantage Service at 317-887-0729 for diagnostic assistance. If a control instrument is determined to be at fault, a new or reconditioned instrument will be sent as a replacement. Return the defective instrument freight pre-paid for a full credit. If the faulty instrument is not returned you will need to pay for it. Use the supplied shipping label to return the instrument the faulty instrument. Purchase a new instrument as a replacement. Send your instrument back for repair, freight prepaid. For a nominal fee (currently $235) your instrument will be repaired and returned. Purchase a new instrument and repair the old one as a back up. If you are sending your instrument back for repair, include this form in the box. Do not disassemble the instrument. Repair charges: Inspection - free; Repair - $235.00; Overlay. Ship to: Advantage Electronics 525 E Stop 18 Road Greenwood, IN 46143 Attention: Repairs. (317-888-1946). Open and print the PDF file of this article (left), and complete the Contact information to include with your shipment. Include in box: part, purchase order, contact name, phone number, symptom (if available). For Priority Service, send the instrument to us via overnight shipment. We usually repair these instruments the same day we receive them! Specifications and Pricing are subject to change without notice or liability. Contact the Service Department at 317-887-0729 for current pricing and return policy information. For more information about warranty repair procedures call the Advantage Service Department at 317-887-0729.